My grandmother refers to me as a “front door” kind of girl: I like the finer things in life and I always have. Should I decide to take an anti-feminist route in the future, I will be finding a very wealthy man (currently taking applications from Kellogg students, as well as pre-med) to keep me in a perpetually pampered state, to which I plan to become accustomed. When it comes to food, I tell myself that I make no exceptions. But in reality, I’m on a tight college budget and have started to make frugal changes in my life. I admittedly smuggle fruit out of the dining halls and have started to go without my daily Skinny Vanilla Latte. The only benefit to being church-mouse-poor is that I am never tempted to indulge in the glorious gluttony listed below, keeping me from dangerous caloric excess and a bank account deficit. After all, I have to be thin until I snag my sugar daddy. But afterwards, I’ll be taking a full tour of this list. 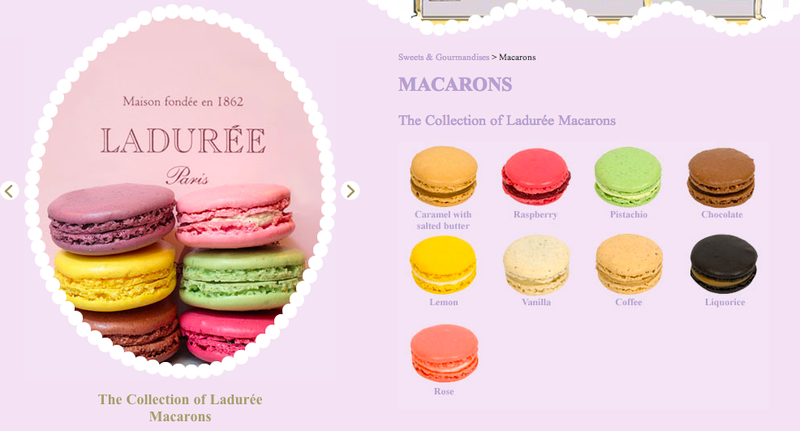 Ladurée, the French company famous for these meringue cookie sandwiches, is so decadent and très cher that even the fictional Upper East Sider Blair Waldorf is a frequent customer. At four dollars for one cookie, these cost a pretty penny, but they are truly worth the splurge. Fluffy and light, they quite literally melt in your mouth, after the initial crunch. I’ve only had them once, when my father picked up a half dozen while in New York on business, but the experience altered me enough that my homescreen on my iPhone is a set of these luxurious treats. If you have some extra cash, try the Blackcurrant Violet, Pistachio or Rose. 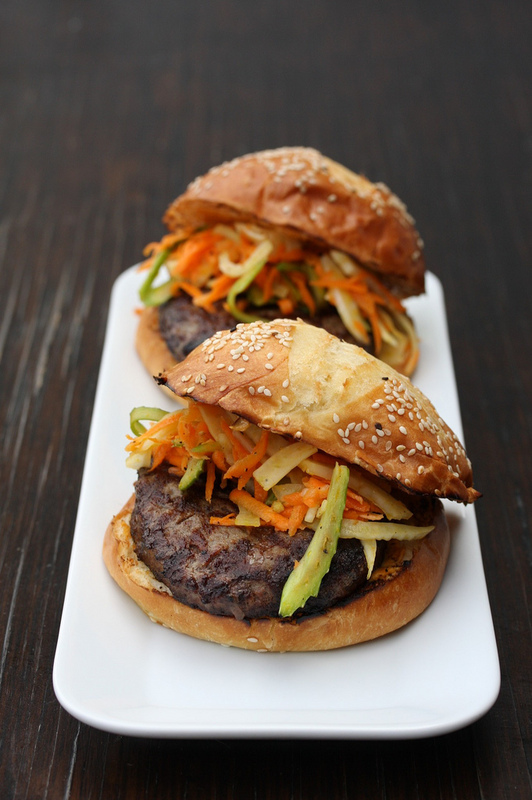 Ranging from forty to seven hundred dollars, the Kobe Beef Burger is easily the richest bite you’ll take (that is, if you ever take it). Kobe beef refers to a cut of beef that comes from a distinct breed and genetic lineage of cattle raised in a specific location in Japan (don’t let that “Kobe-style” poser label fool you). The beef must meet a list of requirements set forth by the Kobe Beef Marketing and Distribution Promotion Association. Rumor has it that these special cows are fed with beer, massaged daily with sake and soothed by calm music, all to enhance the tenderness and richness of flavor. The fact that a cow has a better life than I do doesn’t seem so unjust when considering the high price for the end result squished between a hamburger bun. 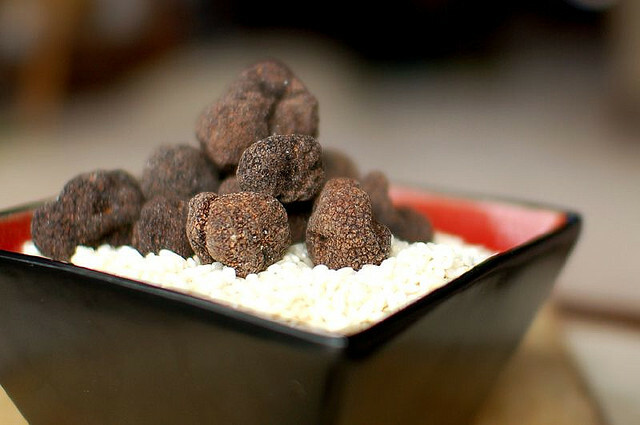 In 2007, a restaurant owner paid $330,000 for a truffle – a term used to describe several species of highly-prized, edible mushrooms – that weighed about 3.3 pounds. Let that sink in, as truffle oil would into a nice grilled cheese. Or pasta with shaved truffle. Garlicky, woody, and even a little pungent, the truffle is easily the most revered and desired addition to any kitchen. In fact, they are so expensive that most chefs use truffle oil to offset the cost, even though the oil isn’t even made from truffles. Still, chefs and gourmands alike will pay a shockingly high price for the synthetic oil, all to simulate an even costlier flavor. Usually, my ice cream fix costs me a cool $4.99, and even that sets me back on my heels, counting the ways I could’ve spent the money. Five loads of laundry! Five Luna Bars! A latte! Entrance into a wristband frat party! But New York City’s Serendipity 3’s $25,000 sundae makes me think in grander hypotheticals. Room and board for two years! 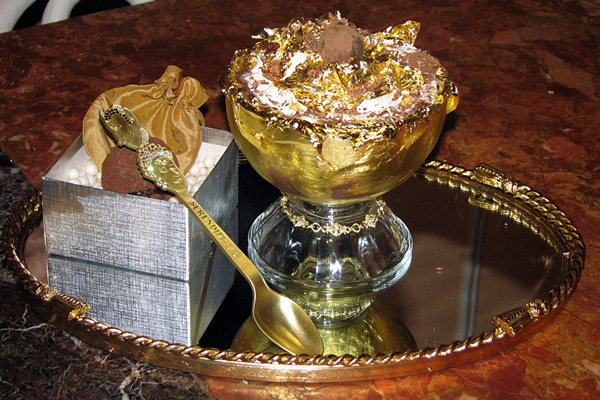 The sundae includes a blend of 28 different cocoas, five grams of edible 23-karat gold and comes served in a goblet lined with edible gold. Oh, and you get an 18-karat gold-and-diamond bracelet, as well as the gold and diamond-crusted spoon you use to eat your money — I mean, ice cream. I wouldn’t mind my future sugar daddy opening a velvet box with this sundae inside instead of the typical, boring engagement ring. Alas, I remain a poor college freshman (and I’m likely to remain so, as “communications major” basically means “poor forever, thankyouverymuch”) and have nary a sugar daddy candidate in sight. So, while I continue to make peanut butter sandwiches and sneak them out of the dining hall under my coat, I’ll keep my eyes peeled for a pre-med student who looks promising. I could always shoot for a high-paying job right after graduation, but didn’t you know that you can marry more in five minutes than you can make in a lifetime?